Hi, I don't know how I got infected but it is driving me nuts. The security center will not start, if I try to start it, it won't let me (the action center says "The windows security center service cannot be started.) also my search results randomly redirect in all browsers and search engines. I've been infected for about a week. Two days ago the computer forced me to re-enter my Windows Genuine product number. I run CCleaner just about everyday. Windows updates every Sunday. I then ran aswMRB.exe twice and it crashed to a blue screen both times. I really don't feel comfortable trying again. Do I need to run defogger after a re-boot, did it shut anything down?? I don't have any virtual drives (unless windows or HP created one,) and I don't use Deamon tools or anything like that. Sorry, forgot to attach the second DDS file. Let's run a few tools and see what they find. Be sure to download TDSSKiller.exe (v2.5.5.0) from Kaspersky's website and not TDSSKiller.zip which appears to be an older version 2.3.2.2 of the tool. Seems my security center is working...but searches still redirect. You have any guess why aswMRB.exe would crash the system but a full Avast scan through the anti-virus main program comes up clean? Lets try another tool to see whats going on. Can you Burn CD's and have a USB Flash Drive You can use? Please uninstall Spybot - Search & Destroy. We will reinstall it when we are finished. Then try aswMBr. Are you able to boot into safemode? If so try AswMbr also in safemode. Can you Burn CD's and have a USB Flash Drive You can use? 21:48:28.072 Disk 0 MBR has been saved successfully to "C:\Users\KVC\Desktop\MBR.dat"
21:48:28.072 The log file has been saved successfully to "C:\Users\KVC\Desktop\aswMBR.txt"
Rerun MBRCheck.exe again by double-clicking on it. Vista/Windows 7 users right-click and select Run As Administrator. Enter 'Y' and then press Enter. When asked: 'Enter your choice:', select option  (Restore the MBR of a physical disk with a standard boot code) and press the Enter key. Enter  (for PhysicalDrive0) and press the Enter key. The program will show Available MBR codes followed by a list of operating systems as shown below. Please select your version of Windows from the list and enter the corresponding number (For example, type 0 or 1 for XP, type 3 for Vista, type 5 for Windows 7, etc)you will enter 5 for Windows 7 and then press Enter. Be careful...if the wrong OS is used, it will render the computer unbootable. When prompted for confirmation: 'Do you want to fix the MBR code?'. 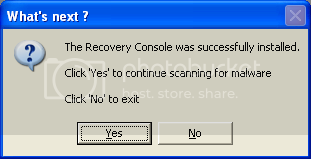 Type the full word Yes (not Y or the fix will not work) and press Enter. Left-click on the title bar (where program name and path is written). From the menu chose Edit -> Select All. Press the Enter key on your keyboard to copy selected text. Open Notepad, paste that text into it and save to your desktop as MBRCheck.txt. When complete, you should see Done! Press ENTER to exit.... Press Enter on the keyboard. Reboot your computer to complete the fix and copy/paste MBRCheck.txt in your next reply. If your computer does not restart on its own, please restart it manually. How is your machine running now? Still getting redirected?